r Luis Fernandes, the current CEO of the German company called FINITE ELEMENTE, adds that it is a numerical calculation method used in the field of mechanical engineering and it basically means the division of a body into several “finite elements“ which are used for the calculation of mechanical stresses. So, the name of the company and its philosophy speak for themselves. He also says that “every new product has a scientific background paired with a strong passion for music” in the development phase. finite elemente is a German company that was set up in 1996. For almost 20 years, it was been a role-model and point of reference for other manufacturers who have been aiming to fight vibrations (the finite elemente company consistently uses lowercase and capital letters in their company names, so, in this case, as it is an interview, I will be using the following spelling: ‘finite elemente’, ‘pagode’, ‘modul’ ‘CERA’, etc.). 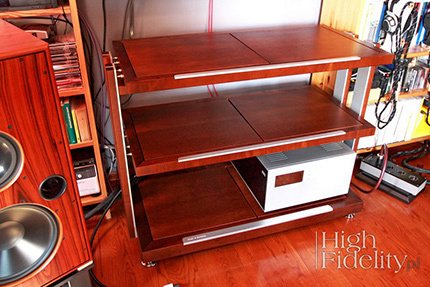 I have been connected with this company for years, as I use its products – feet under the Leben CS-300 (Special Edition) amplifier and the Ancient Audio AIR V-edition player, while the very beautiful Pagode Edition Master Reference anti-vibration rack is the pride of my system. What is more, I have tested a lot of the company products and, from time to time, I take out two “resonators” out of my cupboard – flat discs that are placed on the top panel of devices in order to minimize their vibrations. The company used to be world-famous and top journalists of the audio world would make use of its offer, e.g. Michael Fremer from the “Stereophile” magazine and others. However, something broke down in the machine and the company quickly faded, and then disappeared from the market. 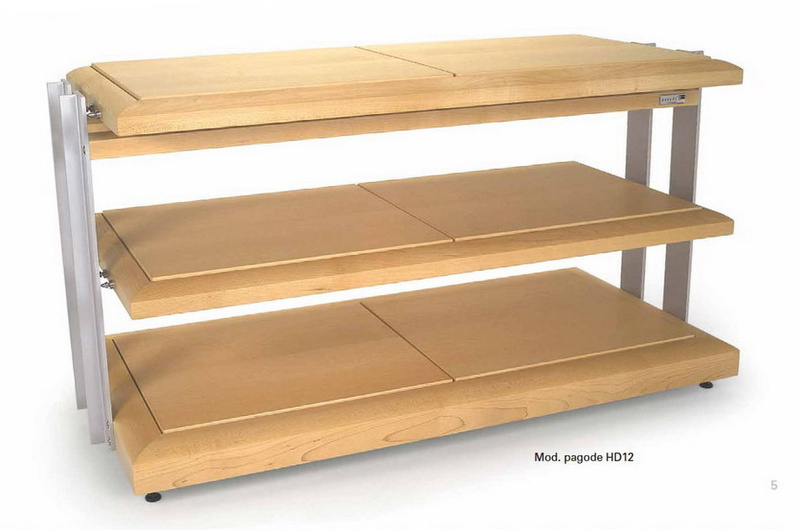 So, when I saw a modest rack with feet from the CERA series during the High End 2018 exhibition in Munich and, next to it, a smiling man that I had seen in some old photographs, I almost jumped up in joy (to tell you the truth, I tripped over my own feet, because I was leaving that room, but let’s say that I jumped up…). The person standing next to the rack was Mr Luis Fernandes, one of the finite elemente company founders. The recently conducted interview below is a simple consequence of the meeting, but not the only one. 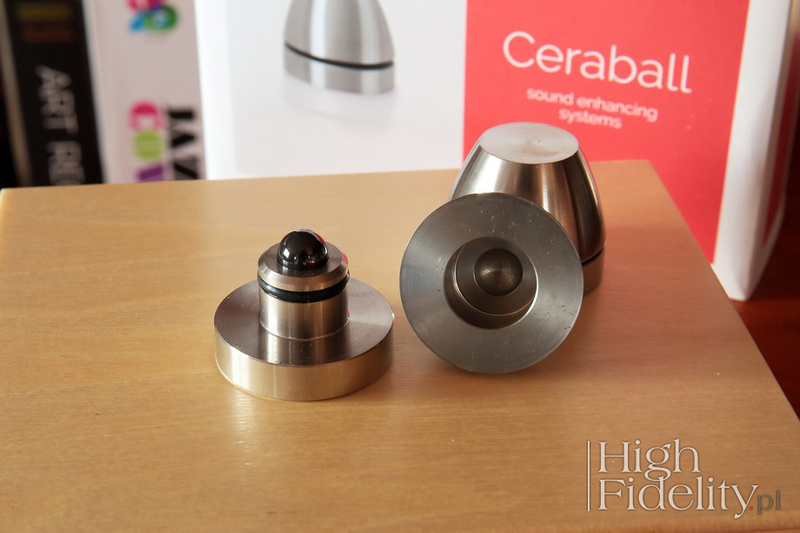 You will soon be able to make yourselves familiar with an article in “High Fidelity”, regarding technologies used by the pagode edition and read about new versions of the CERA feet. And now let me invite you to a tour of the history of the fascinating company. WOJCIECH PACUŁA: Please tell us a few words about yourself. LUIS FERNANDES: I studied to become a professional translator. I worked in the profession between 1988 and 1997, before founding finite elemente at the end of 1996, together with my former partner Bernd Brockhoff. Thanks to this, my passion for music ever since, as well as my passion for high-quality sound since the early 1980s, found their way from a hobby to a profession. Since 1973, I have been collecting LPs, hoping that the “black gold” never goes out of style (it doesn’t seem so, however). So, the analogue is my passion and also the way I listen to music. When it comes to sound evaluation, naturalness and homogeneity paired with the finest detail and emotional content in reproduced music are my focus. I also accompanied the founding of the Audio Physic company and watched it develop in the following years. Audio Physic was located near my place and I also worked for them at the end of the 1980s, assembling the initial 25 pairs of the first Avanti model. At the beginning of the 1990s, I worked as a sales representative for them in Switzerland and Portugal (where I was born), besides my work as a translator. During that time, I also did some sales work for Forsell, selling their turntables in Portugal, too, which gave me a lot of “analogue” experience. My work for Audio Physic also led to several international contacts, which I used later, having founded finite elemente. In this way, we have approached the key question: how did it all start? The founding of finite elemente was preceded by the development of a rack system for my former partner, for his private use. Earlier, he placed his DNM amplification and Mission CD player on a self-designed metal-sheet wall rack which was modern-looking, but awful-sounding. My ideas and audio experience combined with his technical skills led to a design that was similar to the later pagode system to a very high degree. Solid maple wood frames were already used there, attached with spikes to lateral T-shaped aluminium profiles which constitute the characteristic key feature of all pagode racks. The shelves were made of ordinary MDF, so it was nothing special. In comparison to later freestanding pagode racks, this “prototype” was held by two struts in front of a wall, while aluminium pillars stood on spikes. Starting with this, we developed freestanding versions that formed the first generation of the pagode series. How exactly did the finite elemente story begin? I mean – when, where, who? finite elemente started as a small company way back in November 1996, in a German town called Bestwig, in the rural region of the so-called “Sauerland“ (meaning “sour land”), located halfway between the cities of Dortmund and Kassel, 200 km north of Frankfurt, to be even more precise. 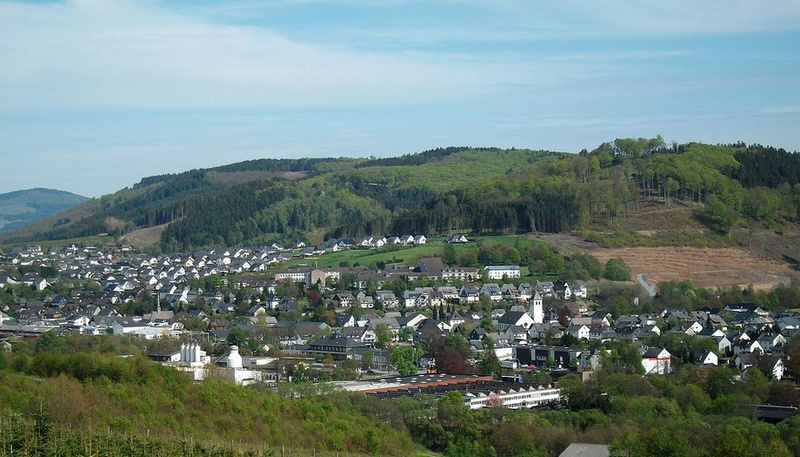 The Sauerland region is known for its countless hills and a lot of forests. The Sauerland is also famous as a big producer of Christmas trees that are also exported to a lot of countries. The company was founded by me – Luis Fernandez and Bernd Brockhoff, the first being a music and high-end lover, the latter – a mountain biker and music listener. 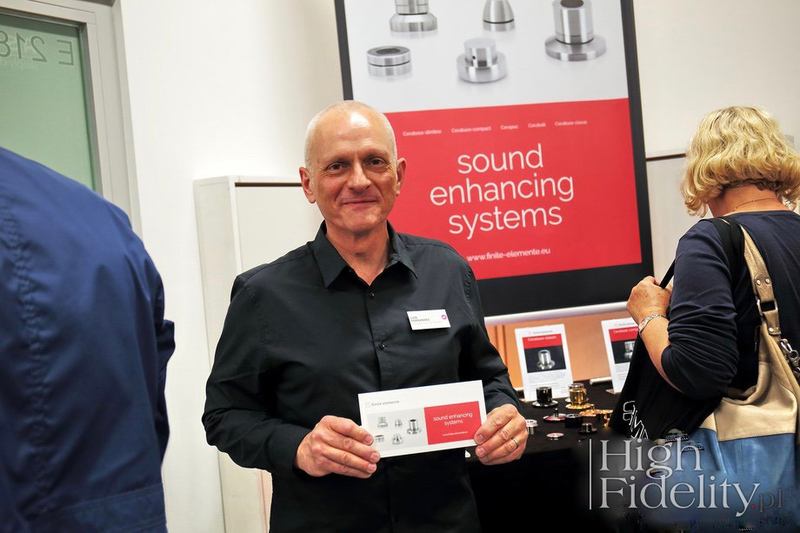 From 1996 to 2006, I ran the operative business, cooperating in Germany with sales representatives and building up the export business due to my numerous contacts gained throughout the years in the audio industry. From 2006 to 2012, my business partner Brockhoff worked for the company on a full-time basis. Until the beginning of 2001, I managed everything from the purchase of materials, the assembly of racks and marketing, to shipping and sales supervision, just to name a few areas of my activity. The first two employees joined the company in 2001, followed by more employees, thanks to the positive development of the company on the market. By mid 2012, there were already 12 employees plus the two owners handling the company business activities. The company goal was to improve the sound of audio systems at the very basis, focusing on equipment supports. 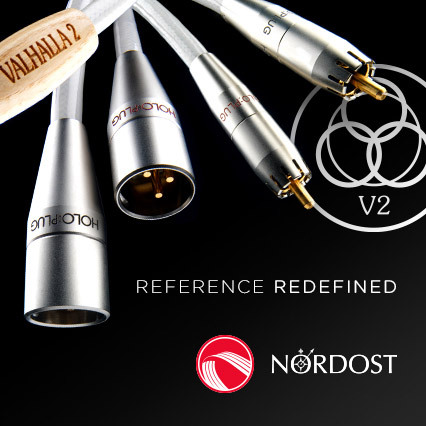 At that time, two main categories of such products dominated the audio world. On the one hand, there were sonically optimized racks with modest to ugly looks. On the other hand, one could buy nice-looking furniture with low or no acoustic potential. Therefore, the main goal was to establish a functional classic design that would both offer natural sound and attractive living room-friendly looks. So, our marketing slogan at that time was: “form follows music” (which, by the way, is currently being re-used by the Japanese company Technics to promote their re-vitalized SL1200 turntable...). This means that looks were strongly determined by functional requirements, according to Louis Sullivan’s dictum derived from the early 20th-century architecture: “form follows function”. How did it develop, i.e. what were the first products and what came next? Our first product was the pagode rack system, first in its basic version with only one T-shaped side pillar (in its second generation it was called the Signature model), followed by a sturdier version for heavier components, i.e. the “Master Reference” with two side pillars, at that time still without the sound-improving “Resonator Technology”. In 1999, finite elemente started scientific cooperation with the University of Applied Sciences in Dortmund, which culminated in the second generation of the “Master Reference” series incorporating the “Resonator Technology”. It is based on simple physics and assumes that every material or object is a kind of a resonator. In order to let audio components operate in a resonance-free environment, it is vital to have equipment supports that behave like that. 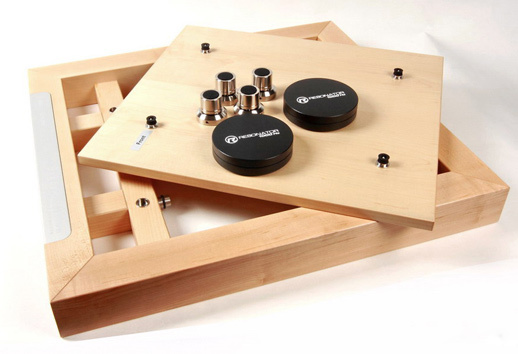 So, it was possible to significantly improve the already resonance-resistant construction of the first generation pagode Master Reference racks by using so-called “resonators”, i.e. metal rods that oscillate at particular frequencies, determined via measurements meticulously conducted at the laboratories of the University in Dortmund. These metal rods were implemented in the shelf-carrying frames. In this way, the pagode “Master Reference” racks offered a resonance-neutral basis for components placed on them. Based on our specific experience regarding the resonance behaviour of rack systems, in 1999 we launched the second rack model in the history of finite elemente – the “Spider”. We avoided the use of shelves by offering a simple framework, which, thanks to the elimination of additional materials, gave us the possibility of resonance control. The concept of the low material-usage ratio of this modular system was later copied by the Swedish manufacturer Solidtech which, by the way, can be seen as a company honouring finite elemente’s earlier approach. In 2000, the basic Signature pagode model also became part of the company’s portfolio, offering a sturdier construction compared to its predecessor. Ceraball foot – one can see a ceramic ball and two pieces that it separates.